Genting Highlands , only fifty kilometers (less than an hour) from Kuala Lumpur, is the most developed hill resort in Malaysia. At 2,000 meters above sea level, it offers a cool respite from Malaysia's capital city combined with all of the excitement, luxury, and entertainment of an international resort destination. In fact, many Malaysian people head for Genting Highlands specifically for its nightlife. There are international dinner shows and discos, while the world-class Casino de Genting offers Blackjack, Baccarat, Keno, French Bull, Roulette, Tai Sai and slot machines. 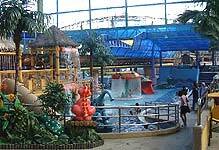 The resort also includes two theme parks, both with dozens of amusement rides and attractions suitable for the entire family. In addition, the Awana horse ranch offers equestrian activities, rides for children and lessons for beginners. For golfers, the Awana Golf and Country Resort offers a challenging 18-hole, par-71 golf course. Accommodation includes the Genting Hotel, the Theme Park Hotel, the Resort Hotel, and the Awana Golf and Country Resort. by Car: Genting Highlands can be reached from Kuala Lumpur via the faster Karak Highway or the slower old Pahang Road (Route 68). The latter passes byMimaland, which may be a good place to stop bybefore proceeding to Genting Highlands. byBus: The Genting Express Bus leaves every hour from the Puduraya Bus Station in Kuala Lumpur. Genting also offers limousines, coaches and helicopter services for charter. Yes, the only water park at 6,000 feet above sea level is now open. Now hotter than ever. What's more? 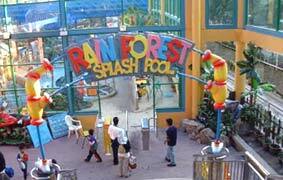 The heated water play area, which is now called Rain Forest Splash Pool, is covered. Come and experience a new world of fun and adventure! Have a splash of time with the Wave Pool, Action River, Big Bucket, Tornado Slide and many more!